From left, Maja Lapkass, Marine Dusser and Helen Wilson share a moment after Lapkass' victory in the mass-start junior girls race at the U.S. Biathlon Championships late last month in Jericho, Vermont. (Photo courtesy of Marine Dusser). Alaska skiers and biathletes collected national championships and spots on national teams during the waning days of winter. Travis Cooper of Kenai and Maxime Germain of Anchorage were named to the national biathlon team last week, the Bjornsen siblings of Anchorage each won two national championships in cross-country skiing earlier this month and Maja Lapkass of Anchorage captured a junior national championship in biathlon late last month. Meanwhile, Alyeska Ski Club racers Daniel Ferucci and Ava Schweiger made the podium at last week’s Whistler Cup, a prestigious international race series for alpine skiers ages 12-15.
Cooper, a National Guard athlete who made his World Cup debut during the 2018-19 season, was one of four men named to U.S. Biathlon’s B team. Germain, a West High senior, is one of five athletes named to the junior national team. “I’m hoping a lot of kids will realize there are so many opportunities if they try biathlon,” said Marine Dusser, a coach for the Anchorage Biathlon Club. Cooper, a National Guard athlete, was among several Alaskans who fared well at the U.S. Biathlon championships late last month in Jericho, Vermont. He won a bronze medal in the senior men’s super sprint. Three other Alaskans claimed medals in the junior races, including Lapkass, a 16-year-old West High student who won a junior national championship in the mass-start race. Lapkass had top-four results in all three of her races. She collected a silver medal in the pursuit and placed fourth in the sprint. Helen Wilson, 17, took the silver medal in the sprint and added fourth-place finishes in the pursuit and the mass-start race, and Matt Eggener, 14, won bronze in the junior boys mass-start race, was fourth in the sprint and sixth in the pursuit. Germain didn’t compete in Vermont. He had a busy season of international competition and needed to catch up with school work, Dusser said. Dusser said the Alaska juniors adjusted well to rainy and windy conditions in Vermont. The group trains at Kincaid Park, which Dusser said prepared them for challenging conditions. “It was pretty difficult to shoot well, but it’s always so windy at Kincaid Park, so they had good practice,” she said. 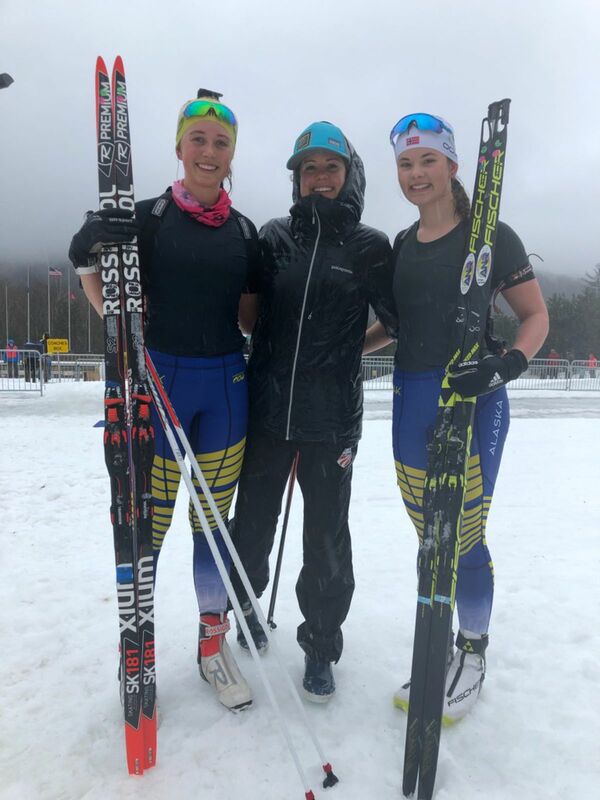 While biathletes were wrapping up their season in Vermont, the nation’s top cross-country skiers were doing the same in Maine. National champions were crowned in three events — the men’s 50K, the women’s 30K and the mixed relay — and the Bjornsens won gold medals in all of them. Erik Bjornsen claimed the 50K national title by beating Anchorage’s David Norris by 9.5 seconds. Anchorage’s Scott Patterson finished fourth to give Alaska Pacific University three men in the top four. Bjornsen won in 2 hours, 13 minutes, 23.5 seconds, followed by Norris in 2:13:33.0. Patterson finished in 2:17:42.1. APU skiers also finished 1-2-4 in the women’s 30K. Sadie Bjornsen led the way in 1:21:29.4, well ahead of teammate and runner-up Rosie Brennan (1:22:03.3). Jessica Yeaton was fourth in 1:23:06.2. Two days before the 50K and 30K races, APU skiers dominated the mixed relay by landing three teams in the top five. Both Bjornsens skied legs on the winning team, which also included Brennan and Norris. The team finished the 20K mixed-technique race in 59:27.7, nearly two minutes ahead of the runner-up team from Vermont’s Stratton Mountain School. Third place went to the APU team of Patterson, Hailey Swirbul, Rosie Frankowski and Logan Hanneman. Fifth place went to APU’s Yeaton, Hannah Halvorsen, Forrest Mahlen and Hunter Wonders. The alpine racing season concluded last weekend in British Columbia, where Ferucci and Schweiger helped Team USA win the Whistler Cup overall award. Ferucci won the boys slalom, was fourth in the parallel slalom team event and fifth in the giant slalom. Schweiger grabbed second place in the girls giant slalom and was 10th in the slalom.